Convincing a squirming toddler to sit still at the dinner table isn’t always easy. In fact, mealtimes can almost feel like a chore at times. You can do yourself a favor (and save yourself some time) by providing your child with a Keekaroo Café Booster Seat. These cute, high-quality booster seats will add a burst of color to your kitchen, and their comfortable design will help your toddler enjoy sitting at the dinner table. Every Keekaroo Café Booster Seat is made in the United States. There’s no question that these seats are crafted to last – they are resistant to all the peels and tears that daily use can bring. These seats are also JPMA certified to contain no toxic components. Instead, you’re left with a safe place for your child to sit. Once you put your child in a Keekaroo Café Booster Seat, he may not want to leave! This is because these seats are designed to be as comfortable for your child as possible. Each booster seat is made from seamless material that is super comfy and soft to the touch. Not only are these seats comfortable for your child, but they’ll also bring you peace of mind. Safety is key with these seats. Each seat has a skid resistant bottom that keeps it in its place. They fit well on most dining room chairs. Security straps are also included to make sure that your child doesn’t accidently wiggle his way to the floor. Cleaning up after dinner is enough of a hassle – you definitely don’t need to have yet another object to scrub down. The designers of the Keekaroo Café Booster Seat are two steps ahead of you here. They’ve designed these seats to be a breeze to clean. They’re resistant to liquids, so any drips and spills stay on the surface where they’re easy to wipe away. Even the messiest eaters will meet their match with this chair, saving you time throughout your day. Just because these booster seats are functional doesn’t mean they have to be unattractive. Their rounded style gives them a cute, unique look that’s miles away from the blocky boosters of ages past. Keekaroo Café Booster Seats are available in a rainbow of yummy colors, including Key Lime, Chocolate, Lilac, Aqua, and Cherry. There’s bound to be a color that works with your kitchen, so why not liven things up a bit? Having a booster seat on hand can make a huge difference in the time and effort spent on feeding your toddler his meals. Keekaroo Café Booster Seats are safe, durable, and easy to clean. Their vibrant colors will add a cheerful splash of color to your kitchen while their safe design will keep your child comfortable and secure. There’s no going wrong with these unique booster seats! You can find the Café Booster along with the full line of Keekaroo products, and everything else you need for your growing child at A Kid Place online. Many items qualify for free shipping – just look for the green and blue truck logo. There’s nothing more exciting than the rush of a rollercoaster. Kids everywhere love the twists and turns that come from roller coasters, and with Anatex rollercoaster toys they can relive the excitement of these thrilling rides. What is an Anatex Rollercoaster Toy? A mass of wires, rods, and beads that integrate to form an intricate wooden toy. Kids can come together to race their beads up and down through a wire maze. Much like a real rollercoaster, Anatex Rollercoaster Toys take advantage of loops, zig-zags, and drops. The bright colors and fun shapes help stimulate young minds, and the dexterity used to push the beads through the maze help create better hand-eye coordination and visual tracking. With many models, the rollercoaster aspect is just the beginning of the fun. Other fun toys like alphabet blocks, memory games, gears, tic-tac-toe boards, and abacuses can be included underneath the coaster. Some coasters even come with special themes like a submarine or outer space. No matter where your child’s interests lie, there’s a coaster that will awaken their imaginations. Anatex Rollercoaster Toys are made in the USA. Designed for use in public areas (doctor’s offices, daycare facilities, waiting rooms), these sturdy wooden toys are able to stand up to the abuse that comes from active play. The wires and beads feature fun, bright colors and shapes. There are a variety of sizes available, from tiny miniature coasters to sprawling tables filled with wires and beads. Where Is The Best Place for a Rollercoaster Bead Maze? If you’re looking for a toy to breathe new life into your waiting room, look no further than Anatex Rollercoaster Toys! Rollercoaster mazes are extremely popular among pediatricians and dentists. It’s easy to see why! Children seem to gravitate towards these colorful toys. 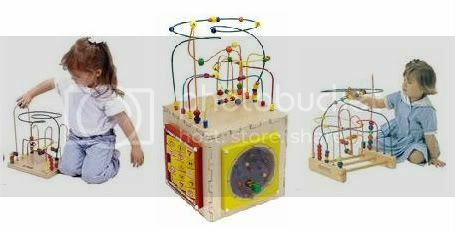 Peek into the children’s area of a waiting room and you’ll likely see a group of kids clustered around a rollercoaster toy, happily working together to race their beads along the wires. The size and complexity of these toys encourage kids to play together and make new friends. Of course, there’s absolutely no reason to leave all the fun at the doctor’s office. Rollercoaster bead mazes are great choices for home use as well. These beautiful wooden toys will quickly become the centerpiece of your playroom. There’s no need for a small living space to keep you from having fun – there are miniature roller coasters that are small enough for any space. Because they’re built solidly, they’ll last through as many brothers, sisters, cousins, and grandkids as you can come up with! Best of all, there are no loose pieces to lose (or swallow) and no mess to clean up. If your kids or patients love the thrilling ups and downs of roller coasters, they won’t be able to get enough of Anatex Rollercoaster Toys. These solidly made, colorful mazes of wires and beads will delight any young ones that come your way. Whether you’re looking to rejuvenate your waiting room with waiting room toys or give your children a toy that will last, a wooden rollercoaster toy is the way to go. Drab, quiet days can get boring, especially if you have little ones that need entertaining. Instead of flipping on the TV or computer, why not give your children the opportunity to fill their lives with music? A Schoenhut daycare piano is a great way to introduce your child or toddler to the world of performance. A full size piano can be intimidating for a learner. A Schoenhut daycare piano, on the other hand, features only 37 keys. This makes it about half the size of a standard piano. For little hands, a smaller keyboard is much more approachable. 37 keys span three octaves, so although it’s small, there are still plenty of notes to hit. A songbook is included that contains many popular children’s songs, so your child can begin to play music he knows right away. A wooden daycare piano is a great place for your child to start learning to make music. These pianos are designed with the idea that your child will be able to take the skills she learns in play and transfer them to a full size piano. To accomplish this, the keys on a Schoenhut daycare piano are spaced the same way they would be on a standard piano. This gets your child used to stretching her fingers. You’ll also receive a color coded chord chart to set up behind the keys, allowing your child to learn the notes in a simple, intuitive way. When she’s ready to move up to a full size piano, you can transfer the chord chart as well. These daycare durable pianos are designed to be used in an environment where lots of children can enjoy the constructive play they offer. As such, they are built to a standard that allows them to stand up to the punishment that communal toys can take. Each piano is handmade and designed to last, no matter how active your future Beethovens may be. While Schoenhut daycare pianos are very useful in daycare centers, that doesn’t mean they can’t be used at home as well. In fact, they’re ideal for playrooms that don’t have the space for a full-size piano. At a little more than two feet wide and a little less than a foot deep, these miniature pianos can fit just about anywhere. Their size makes them easy to move, allowing your child the opportunity to give concerts in the living room at a moment’s notice. 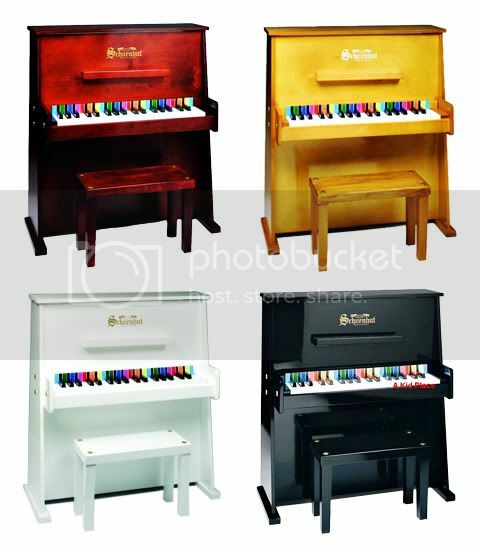 Available in Black, White, Oak and Mahogany, you will find a daycare durable piano by Schoenhut to match any décor. Best of all, their durable construction means they’ll still be standing for little brothers and sisters to test out their own musical skills. Giving your child the gift of music is a worthwhile investment in their future. The skills learned on a Schoenhut daycare piano will stay with them throughout their lives. Whether they go on to a full size piano or not, the fun they have learning how to play an instrument will certainly stick with them for years. Keeping kids entertained can be a tough task, especially if the weather is not cooperating with you. Having Anatex Activity Tables on hand can make an afternoon indoors whiz by. 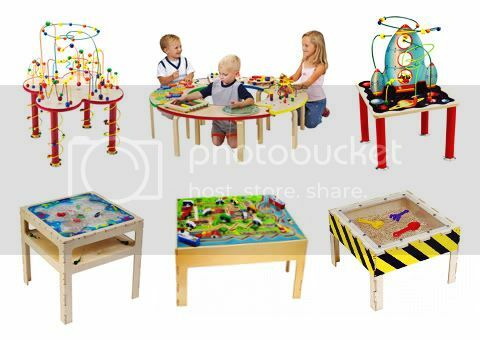 These bright and engaging wooden tables will keep little ones active, stimulating their minds without noisy gimmicks. At the core of each of Anatex’s Activity Tables is an adventure. While they’re playing, your children will experience new places and ideas that they won’t get to try out any other way. They’ll explore underwater landscapes, blast off into space, or control their own cities. Instead of passively watching the world go by on a screen, they’ll actively immerse themselves in places they’ve only imagined before. If you find your toddlers drawn to learning new things, they’ll love the new skills they can acquire through activity tables (and so will you). Thought-provoking activities abound, promoting thought and constructive play. Who knows - a budding Mozart may play his first notes on the Musical Slices of Fun Table, or a Neil Armstrong in the making may go on his or her first trip into outer space on the Anatex Space Shuttle Rollercoaster Table. Anatex Activity Tables are great for the home, but that’s not the only place they come in handy. If you run a doctor’s office, dentist’s office, or any other place with a waiting room, having one of these tables available for your youngest clients is a smart move. A child who is happily playing while they’re waiting will be happier and calmer when it’s time to see you. You’ll also be confident in knowing that moms and dads are appreciative of the entertainment for their child. Activity tables are perfect for group play. They’ll be the center of attention in any play area, so there will never be a lack of potential new friends around them. Through playing together on the same table, your children will learn how to work well with others. Collaborative play can lead to adventures of the imagination that are hard to come by when playing alone. Don’t be surprised if your child begs to go back to playing after a day spent exploring and dreaming with her friends. What good is a toy that breaks after being played with for five minutes? There are no worries of that here. Anatex Activity Tables are built to last. These well made wooden tables are built to stand up to the abuse that toys tend to take, making for a product that lasts. This makes them perfect to use in schools and daycare centers where children will be able to enjoy them year after year. It can be hard to find high quality toys that stimulate your children instead of merely keeping them occupied. An activity table is the perfect antidote to this struggle. The high quality, constructive fun that they give kids will stick with them. Whether you’re at home, at school, or facing a waiting room, having an activity table nearby will keep them entertained and engaged.